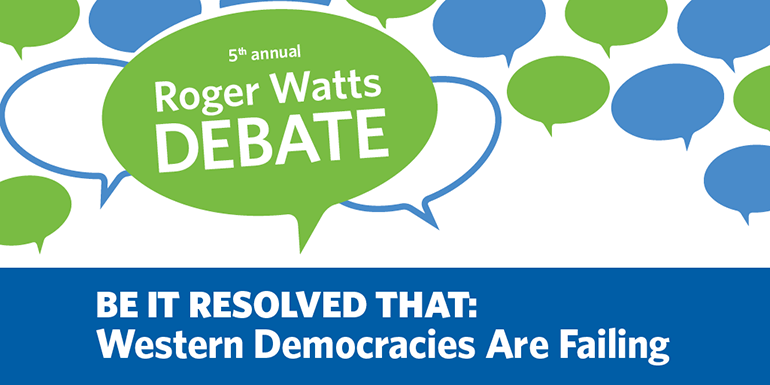 When: Wednesday, March 28 starting at 5:30 p.m.
UBC Okanagan’s top debaters face off against one another Wednesday at the fifth annual Roger Watts Debate. The topic up for debate this year is ‘Be it resolved that Western democracies are failing’. A panel of community leaders will judge the student debaters, with a top prize of $1,000 awarded for first place and $500 for the runners-up. The debates are named after the late Roger Watts, a respected member of the Okanagan’s legal community, and a skilled orator and strong advocate.